NCAA Basketball Women's National Champions, South Carolina Gamecocks Scroll Saw Pattern. Rob Austin's Workshop. 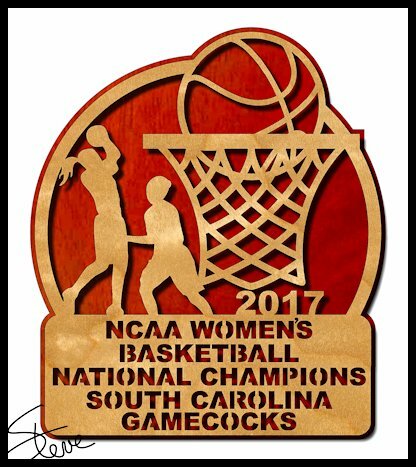 It was an all SEC final as the South Carolina Gamecocks defeated the Mississippi State women for the 2017 national championship of basketball. I have not watched the game yet because I was out of town. From the articles I read it sounds like USC dominated the lane and were the fresher team. It was a great season for USC as their men's team also made it to the final four of their tournament. Congratulations to the Lady Gamecocks and all their fans. At The Woodworking Show, Atlanta we had a giveaway for a $100 gift certificate to Bear Woods. I want to thank Stephen at Bear Woods for sponsoring this giveaway. Please support this fine sponsor and visit his site. We want to support the businesses that support our community. Bear woods is a trusted site for woodworker supplies, clock parts, hardware and the Pegas scroll saw blade. George S. is the lucky winner. The phone number on the ticket is legible and I will be contacting George 4/6/2017 to get the information to process the gift certificate. Congratulations George. None of the information collected on the tickets will leave my hands. They will be destroyed and will not be used for any email marketing or other sales pitches. Thanks to all those who entered. I met a lot of wonderful people during my trip to Atlanta. Rob Austin is right at the top of the list. Rob has a passion for woodworking. He shares that passion with friends and strangers alike. Rob built his dream shop a few years ago. He goes out of his way to make everyone who visits his shop welcome. From what I have been told the shop says pretty busy with visitors most weekends. Rob invited me for a visit after the Monday night meeting. When I arrived there was a sign over the shop door that said "Playground for Adults". I had no idea how true that sign would be until I opened the door. Wow! Rob's shop is not only large it is beautifully maintained and clean. I immediately knew that many of you would love to see this shop. I grabbed my iPhone and asked Rob to give us a tour. The following video is a walk through of Rob's workshop. Enjoy. Thanks Rob. If you are reading this in the email newsletter you may not see the video. Click this link and watch it in you browser. 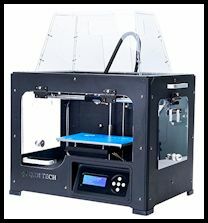 This 3D printer is not cheap but it has worked fantastic for me in my shop. The build volume is large enough to print some very useful shop items. If you are willing to invest in learning the software you will find this printer very useful.